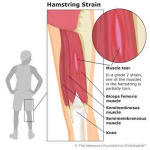 Hamstring stretches for kids are suited to improve overall flexibility and to prevent muscle pulls and tears. Many young kids engaging in sports and other outdoor activities often do not warm up sufficiently before games and practices. Although kid’s muscles generally are more flexible than adults, habituating stretching and strengthening routines are good for kid’s daily activities. This stretch helps soothe your hamstrings and the neck. Stand upward with your knees shoulder width apart and your arms down at your sides. Slowly bend over at your hip joint, ensuring that the knees are bent while performing this stretch. Continue to bend the hip joint until feeling an intense stretch in the hamstrings. Hold this position for 30 to 60 seconds, depending on your flexibility. Afterward, leisurely bring the upper half of your body to a normal standing position. This stretching exercise is not recommendable for people with back injuries. This hamstring stretch is for child runners wanting to relax before a race. Sit down on the ground with your back straight and both legs in front of you. Bend one leg until the foot of this leg is flat on the ground. Then, cross the leg over the other leg, ensuring that your other leg is flat and extended on the ground. If your left leg is bent, take the right elbow and push it against the left knee. Hold your left hand on your left hamstring while performing this stretch. Push your elbow against your knee for 10 seconds. 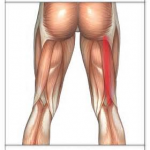 This exercise stretches the hip muscles and the hamstrings. This hamstring stretch improves balance and overall flexibility. Stand up straight with your hands by your sides and your legs shoulder width apart. Next, lift both of your arms up until they reach shoulder height. Keep your palms facing the ground while shifting your weight onto either the left or right leg. While shifting your weight, bend forward at the hips at the top half of your body over your legs. While holding this position, extend one leg and hold for 15 seconds. Relax for 10 seconds before doing this stretch with your other leg. Aspirin and most of the other non-steroidal anti-inflammatory drugs (NSAIDs) are not recommendable for children except under doctor’s supervision.